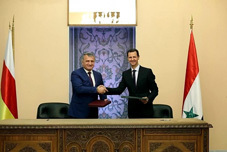 After hosting the so-called president of Georgia’s breakaway region of South Ossetia in July 2018, the President of Syria, Bashar al-Assad this time invited the de facto leader of Russian-occupied Abkhazia, Raul Khajimba in Damascus. The two “presidents” also awarded each other with special orders and exchanged views on advancing cooperation. 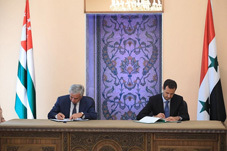 Bashar-al Assad congratulated Khajimba on the “10th anniversary of independence” from Georgia. Russia occupied Georgia's breakaway Abkhazia and South Ossetia in August 2008. Syria recognized these regions as independent countries on May 29, 2018. The international community denounced the step of Damascus. Only Syria, Russia, Venezuela, Nicaragua, and Nauru recognize these two separatist regions as independent countries.